It seems I'm having cupcake withdrawals from my cupcake withdrawals. In all seriousness, I'm always having cupcake withdrawals. Even on my (mostly) gluten-free diet, I can't help but indulge in these sugary packages of delight. Cupcakes are happiness in food form, or so I'm convinced. 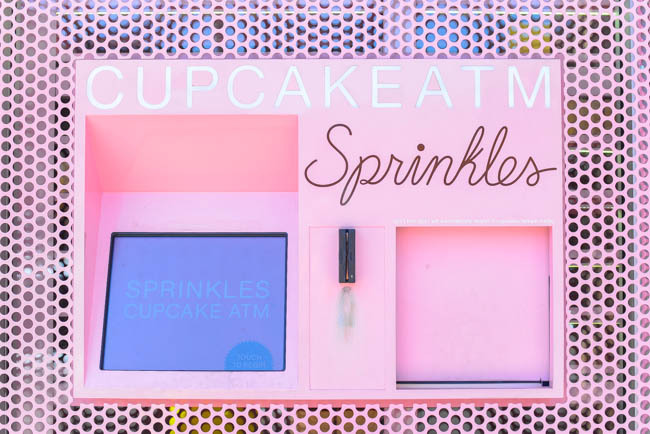 So, you can only imagine my sincerest amusement and joy when we stumbled upon Sprinkles, a real-life cupcake ATM machine in Beverley Hills right off Rodeo Drive, and something I'd only ever fantasized over. Seriously - cupcake withdrawals now have a completely new meaning. But then again, I was wearing my latest design that I created myself, a pop of yellow in addition to my line of skirts (launching soon! ), which in itself is another fantasy come true. See, fantasies do come true!